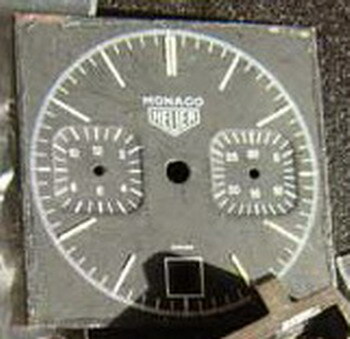 There has been considerable controversy and debate about the question of (a) whether Heuer actually produced Black PVD Monacos or (b) whether Heuer might have commenced the project of producing these watches, but abandoned the project after encountering difficulties, leaving some of these watches produced by Heuer (as pre-production prototypes) and others to be assembled from the parts that Heuer had ordered for the project. Here, we present both versions of the story, and also present a Registry of these Black PVD Monacos. 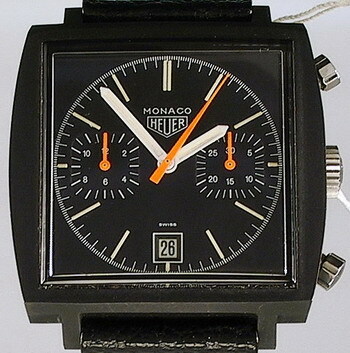 In recent e-mail correspondence, Mr. Jack Heuer has confirmed that Heuer produced the Black PVD Monacos. 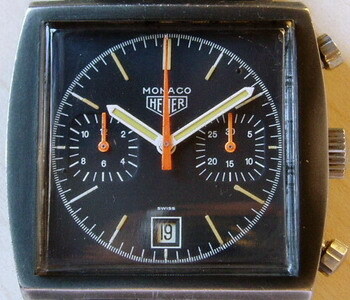 According to Mr. Heuer, the Caliber 12 (automatic) Monacos, launched in 1969, were not a success in their early years. 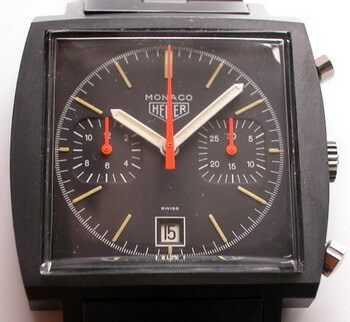 The case was too bulky, the avant garde style appealed to some enthusiasts but was not widely popular, and the Swiss chronographs faced difficult competition from other chronographs (especially the Seikos), as a result of comparative exchange rates between the US dollar, the Swiss franc and the Japanese yen. 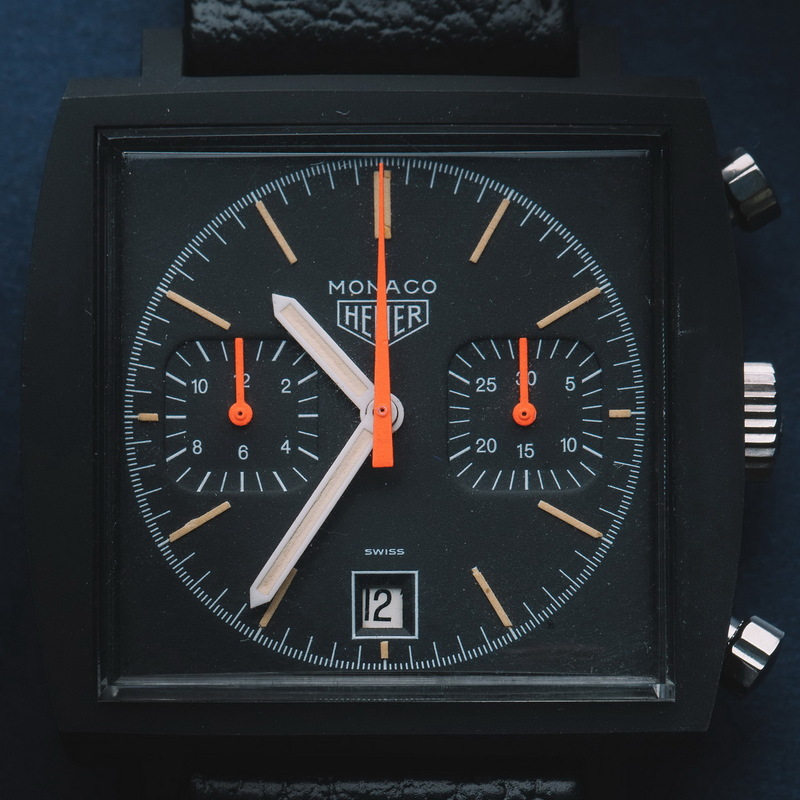 Heuer’s first change in its line of Monacos was to offer the Caliber 15 model, deleting the hour register in favor of a single-register automatic chronograph and making other cost-savings changes. 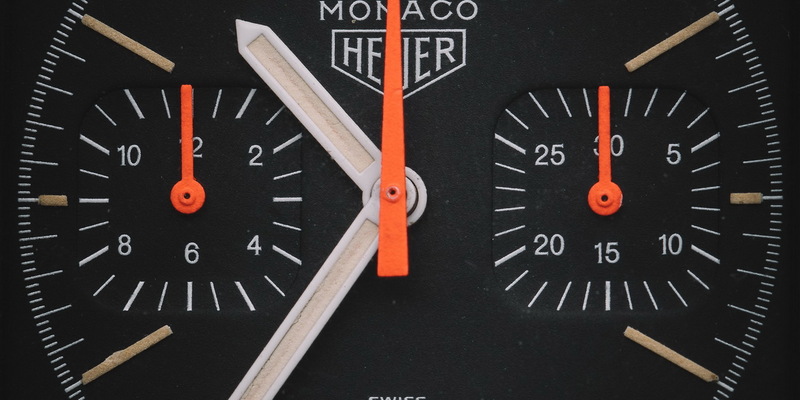 As the Monaco began to find some consumer acceptance in the mid-1970’s, Heuer introduced three-register manual-wind models, with dials in either blue or gray. 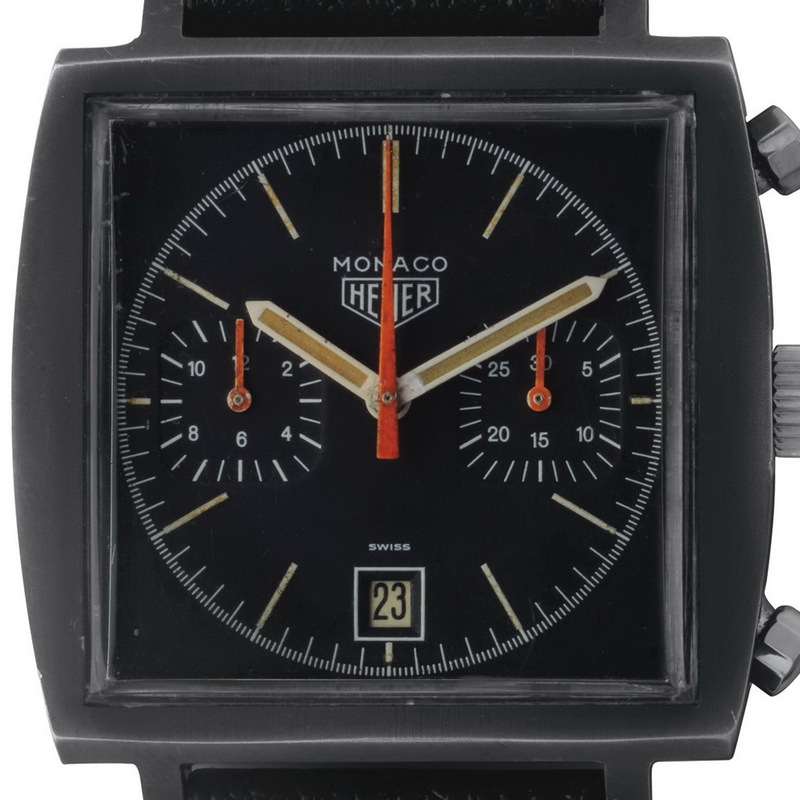 Mr. Heuer indicates that the Black PVD Monaco was the final execution of the Monaco, offered in response to the fashion trend of the mid-1970’s which favored this “military” look. 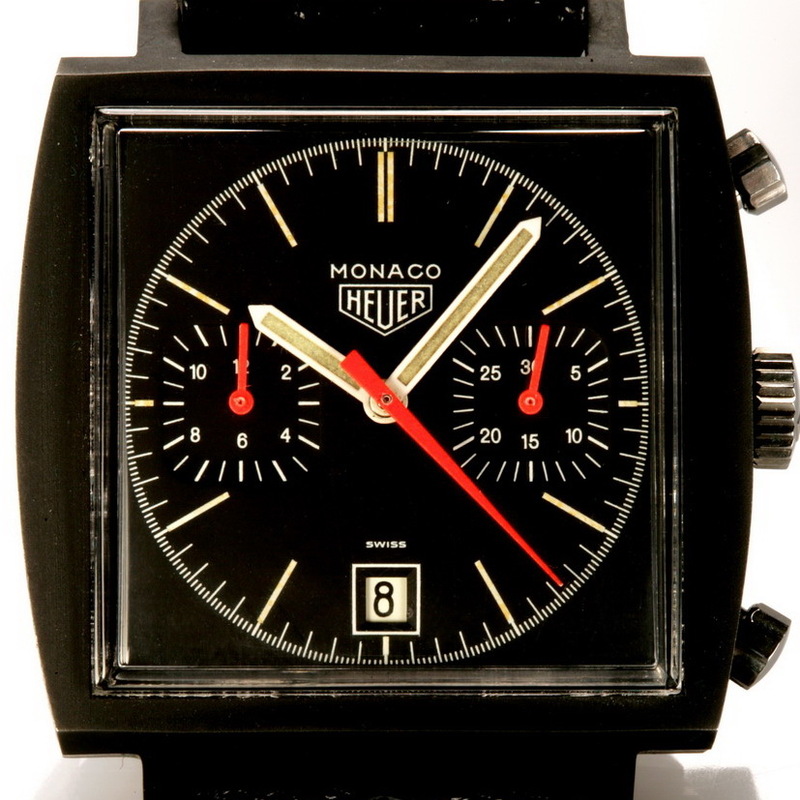 According to Mr. Heuer, the Black PVD Monacos were sold through normal commercial channels, though he does not believe that they were offered in the United States. 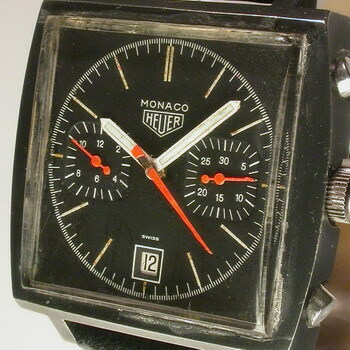 This could explain why people associated with Heuer in the United States , during this period, never saw these watches. 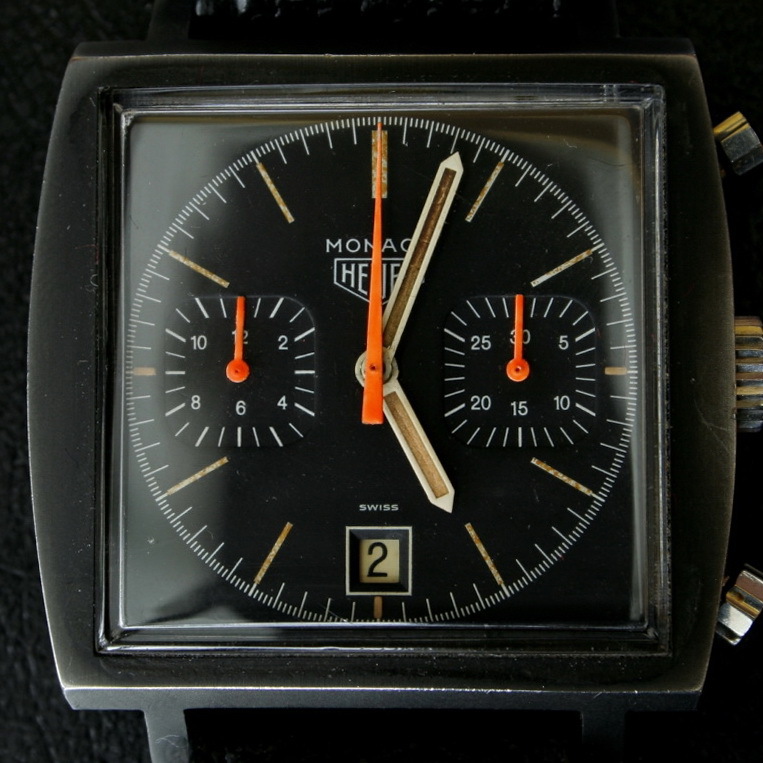 Those who question that Heuer produced the Black PVD Monacos tell a very different story. 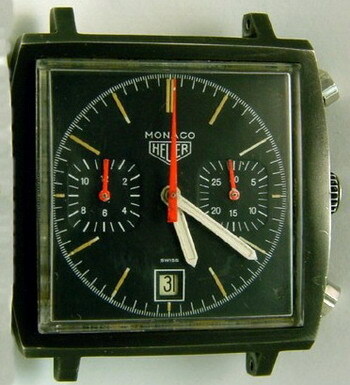 Heuer began the project of developing Black PVD Monacos, but had difficulty producing the cases. It was difficult getting the PVD to stick to the sharp edges of the cases, and Heuer abandoned the project. 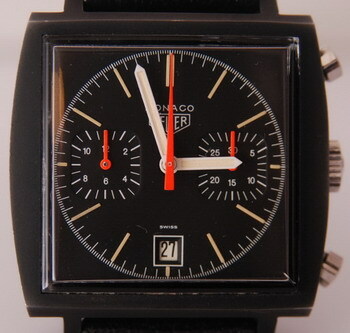 According to this version of the story, Heuer had the unique black dials and PVD cases produced; Heuer assembled a very limited number of the watches; Heuer then anandoned the project, having on hand some remaining dials and cases that had not yet been assembled into complete watches. 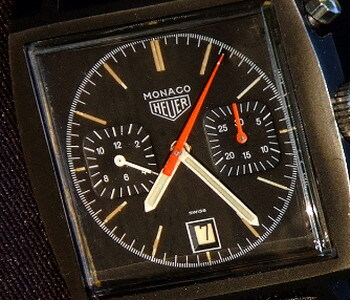 Some speculate that a party other than Heuer completed assembly of several Black PVD Monaocs, from these parts that had been produced for Heuer, and that these are the watches that have slowly made their way into the collectors’ market in recent years. 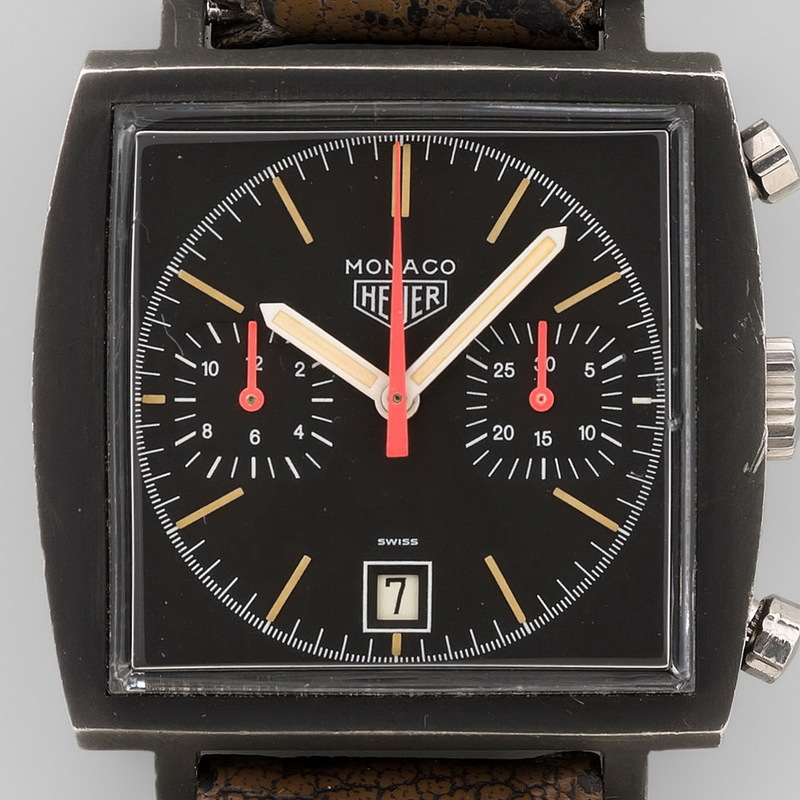 Regardless of whether you are of the view that Heuer produced the Black PVD Moancos, as a normal production watch, or that these are merely Heuer parts that were assembled by some other person, there can be agreement on one fact: these are very rare and higly-valued watches in today’s collectors’ market. As of this writing, the typical price range would be approximately $5,000 for a project watch (genuine case and dial, but other parts not authentic) to approximately $10,000 for the very best watch, in near mint condition. Cases — PVD is applied to a “flat” metal surface; black coating over a brushed surface will indicate that case was from more common steel Monaco and is not original for the PVD Monaco. Reference Numbers / Serial Numbers — There should be two numbers engraved on the case, between the lugs — the reference number (740303) and a serial number (usually 256XXX); note that the correct reference number is 74033, but the number on the cases is 740303. The engraving of these numbers is usually very light, and difficult to see. Numerals — Perhaps the most distinctive feature of the PVD Monaco, not found on any other Monaco, is that the “12” and the “6” on the chronograph hour recorder, and the “30” and “15” on the chronograph minute recorder are higher (for the “12” and the “30”) and lower (for the “6” and the “15”), than the adjacent numbers. If all these numbers are on the same horizontal plane, you are probably seeing a refinished dial. Markers — Single markers for each hour, with double marker at 12 and half-length markers at 3-6-9. Hands — Main time-of-day hands are “military” style, similar (or identical) to those used on certain Autavias and Silverstones of the period. Chrono Second Hand and Needles — a distinctive orange / red, unique to this watch (not used on other Heuers); needles seem to have been subject to deterioration over the years. Crown and Pushers — Stainless steel, as on other Heuers, not black. Case Back — Should have the Heuer logo, and the Tool 033 mark (referring to the tool used to open the case). 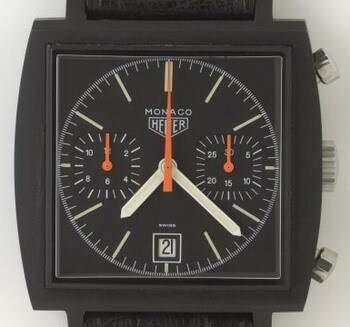 Please contact me with an questions about this Registry, or if you have photos of a Black PVD Monaco that should be included. Sold by Schuler Auktionen, Zurich, November 2014. Sold by Christie's, June 2017, for $43,750. Auction page is HERE. This sample is included in the TAG-Heuer archives, at the company’s headquarters, La Chaux-De-Fonds, Switzerland.